﻿Also download our Wedding Planning Guide here﻿. Gypsophila Bridal strives to help and advise brides in any way possible. Please find some frequently asked questions and answers below that may help you on your hunt for the perfect wedding dress and accessories. If you have any further questions feel free to call us on 01926 613030. The experience of shopping for a wedding dress can be stressful. You find yourself in a situation that may have no experience of, being asked questions about cut, materials and design that you don't know the answer to. There are emotions at stake as every woman, whether spending £500 or £1,500, feels that this is the most important dress of her life. There are a few points below to help you. HOW FAR IN ADVANCE SHOULD YOU BUY A WEDDING DRESS? There is no rule for this question as it completely depends the individual. We have many brides that visit years before their wedding date to gauge ideas and find styles that suit through to brides getting married within the month and needing a dress ‘pronto’! If you want to maximise your choice and get a dress from the latest season then you really need to have chosen and ordered a dress at least 6 months prior to the wedding date - as this is the standard lead times from the designers. Give yourself a few months prior to this to have a good look around and try on a good selection. If you are getting married quickly, then do not fear as we have a range of stunning designer gowns that can be bought off the peg and taken home immediately if required. We do advise that you call to book an appointment prior to your visit to ensure that a member of staff is available to advise you and help you try on dresses. However if you would like to pop by to browse through the rails, then you are welcome at any time. I'M ON A DIET, WHAT HAPPENS IF I LOSE WEIGHT? Bridal wear often runs smaller than ready-to-wear; if you normally buy an 8, you may need a 12. So forget the numbers and don't insist on a smaller size because you intend to lose weight before the wedding—order the one that fits now. A gown is easy to take in, but difficult and costly to let out. 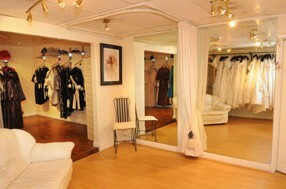 If you then loose weight prior to the wedding then you can just have it tailored to fit. We always recommend to bring one or two of your closest friends or relatives - anymore and the experience can be a little overwhelming and confusing. Make sure to choose someone who is open minded and you trust to give you the best advice and support. There are beautiful dresses available at almost every budget so never feel pressurised into spending more than you feel comfortable with. First things first – think about your overall wedding budget and consider how much is available to spend on your dress. Tell the sales assistant so they can help focus your search and try not to look at dresses that are out of your price range, unless you have the flexibility to go over budget. If you don't, then use top of the range gowns as inspiration for a less expensive design, so you won't have to spend a fortune. We have off the peg dresses available from £200 through to top designs at £1,500 with the majority of our gowns being around £700-£800.